From 16 November, Calverley Grounds will be transformed into the ultimate winter destination, signalling the start of the festive season. 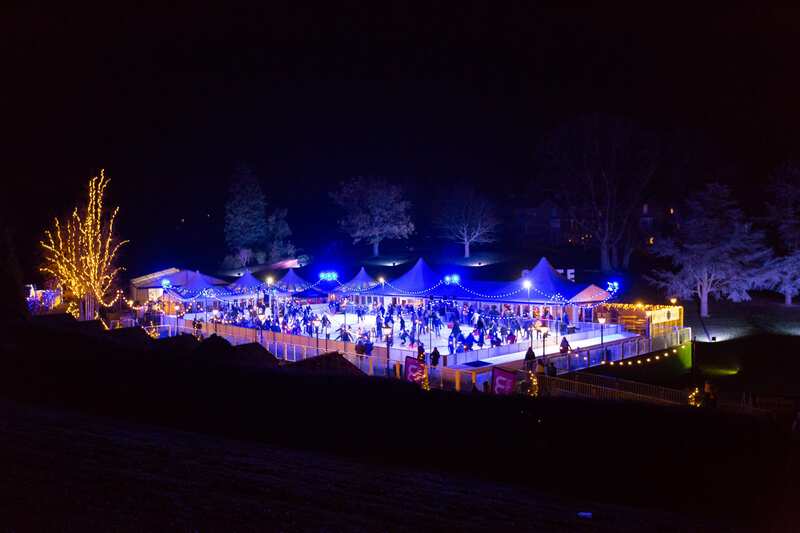 The Tunbridge Wells ice rink returns for 2018 with stylish skating, festive food and drink, music and Christmas shopping inspiration. Booking is open now. By day or night, visitors can skate in the beautiful splendour of Calverley Grounds’ amphitheater, decorated for Christmas with twinkling festive lights. Our very special launch event will be taking place on opening night Friday 16 November, all exciting details to be announced very soon. Storytelling workshops will be taking place and the ice rink will once again collaborate with The Forum – the lifeblood of the live music scene – and host live music events every Thursday night. We will also have local choirs performing between 4pm and 6pm every Sunday and there will be special ‘Tunbridge Wells In Winter’ themed talks from team members of the Tunbridge Wells Museum. We are also offering chalets for hire to make this year’s Ice Rink experience as immersive and special as possible, full information on booking also coming soon. Full access will also be provided daily for the event. Main skating sessions will take place from 11am until 8pm. Please note the last skating session will be 6pm on Christmas Eve, Boxing Day, New Years Eve and New Year’s Day. Skate tickets are now on sale, adults £14.50 and children £9.75 including skate hire. A booking fee of up to £1.75 per ticket will be applied on all tickets booked by phone or in person. On-line booking fees are only £0.85 per ticket (over 50% off other booking methods). Sessions sell out quickly so it is advised that visitors book tickets in advance to avoid disappointment on the day. Go! Card tickets available at £5 and seals will be available at £4. Dedicated thirty minute Parent and Toddler sessions will take place every morning at 9.45am, 10.15am and at 2pm until the schools break up for Christmas. Price £9.50 which includes toddler and adult tickets and seal skating aid.